unloading in a silo does not work. the dumpster does not tip. The model is pretty, the operation is not. The trailer is an interlink configuration consisting of a first trailer behind the horse that has a fifth wheel to which the 2nd trailer attaches. 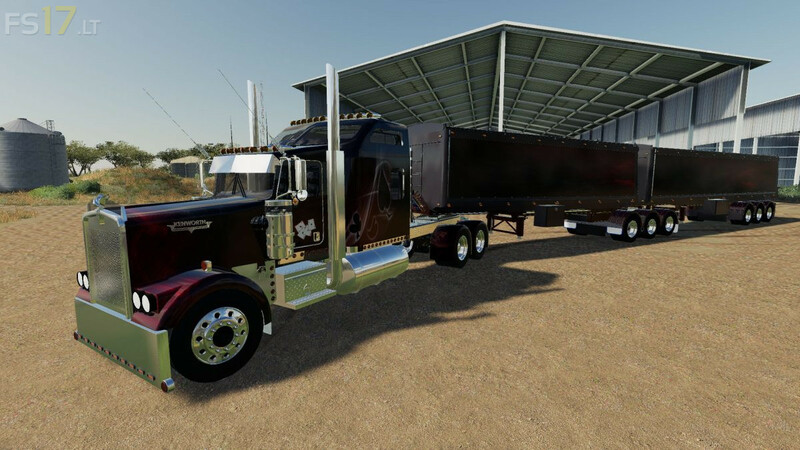 The first trailer will not dump its cargo at all even if you look to try and dump on the ground. I had to reset it and lost my corn crop that was loaded. The 2nd trailer will dump but only through the small dump gate at the back, consequently the trailer lifts very high and catches the roof of any sites like Central Grain Elevator. It also would not dump for me when the first trailer is attached, only when on its own. When riding over a storage grate the indexing is wrong and the signal to press I to offload comes as the trailer is already riding off the grate. The tractor horse steering doesn’t graduate as and feels way over sensitive compared to other trucks. The camera view is also pinned at the back of the horse (probably because the whole rig is so long when all traliers are attached) but its weird when riding the horse on its own.